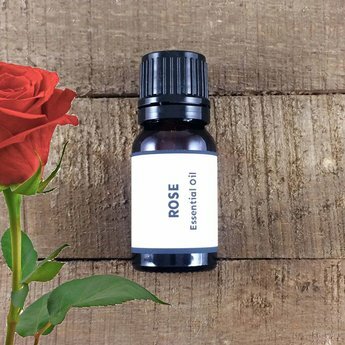 Rose (Rosa damascena) essential oil is an orangish-red liquid displaying a deep, rich, warm, honeyed-roseaceous bouquet. A mood uplifting oil that calms the heart from stress, emotional shock and grief. This warming oil is also an aphrodisiac. This is a 10% dilution in a base of fractionated coconut oil. Direct Palm / Nasal Inhaler: Place a drop of oil in the palm of your hand, gently rub the hands together, cup your hands around your nose and take a deep breath in through the nose to soften the heart. You can also add several drops to nasal inhaler and breathe in throughout the day. You can repeat multiple times though out the day. Atlas cedar, bergamont, chamomile, clary sage, frankincense, lemon, mandarin, rosemary, sandalwood, sweet orange, vanilla. Fun facts: Native to the Mediterranean. It used to be consisted more precious and valuable than gold. The Persians, Greeks and Romans bathed in rose fragrance and used it in religious ceremonies, burials and sacrifices. Cautions: Considered non-toxic and non-irritating.